I am happy to announce that Larry Fisher and Dawn Babbush (the husband and wife co-proprietors of The Vortex) had a healthy baby boy this morning. Not only did he arrive on the exact date the doctor projected, but labor lasted was only 10 minutes. If my mood today was any indication, I bet this little fella was jonesing to get out and enjoy some (long awaited) New York City sunshine. 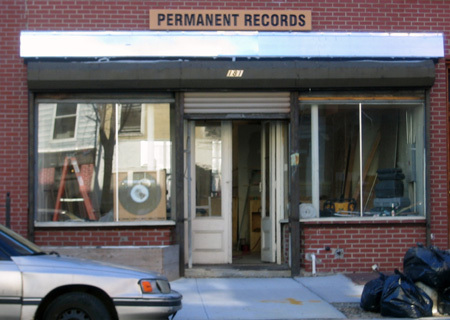 Greenpoint vinyl fetishists, don’t despair: The Thing (at 1009 Manhattan Avenue) is alive and well. And some competition has just moved in a block away at 181 Franklin Street. Looks like it will be a little while before these guys are ready to open, but it makes me happy to see that Franklin Street is thriving… AT LAST! Believe it or not, there was a time (not too terribly long ago) when Franklin Street was the main shopping district hereabouts, not Manhattan Avenue. I thought it would be fun to throw out a bit of trivia for youse guys to banter about at cocktail parties (or use as a ‘ringer’ for bar bets— my personal favorite). cooking up a little something extra special for BARC’s upcoming sidewalk sale.